PP Corrugated Board is a plastic medium with character of hygienic, durable, versatile, lightweight, tough, flexible, easy to form, water resistant and able to resist to chemical, and is 100% recyclable. Its end product is definitely a better idea over conventional packaging & protection materials. PP Corrugated Board differentiate by 2 grades, ie general grade and Conductive grade. General grade is used to produce end product for general usage, whereas finished product made by conductive grade is specifically catered to protect high sensitive electronic products from static charges. PP Corrugated Board consist of carbon which could directly conduct away the static charges from harming the sensitive and high value electronic products. Our PP corrugated board is strictly flat, without wrapping, enhanced with corona treatment for better result printing, suitable for silk screening or flexographic process. This is also a more cost effective advertising material. We are the manufacturer of high quality PP corrugated plastic products. Our plastic products are mainly custom-designed plastic packaging product. We always strive to help our customers' in design packaging to enhance efficiency in their production process, reduce their reject rate, improve surface protection, and obtain lowest cost yet durable type of packaging. Our plastic product serve to fit customers' exclusive product in proper packaging condition which need prime protection, its durability has increase its reusable life by ten-fold. Our plastic products are produced from PP corrugated board with high quality, its process technology is derived from European Technology. It comes in various thickness and colours, it is strong yet light weight. It is durable and can be cleaned easily too. Its characteristics such as water and chemical proof as well as non-toxic fibre free, make it safe and convenient to use by all industries inclusive food industry. The remarkable combination of having in-house fabrication facilities enable us to fabricate boxes, layer pad, divider, partition, cover etc, and can additionally offer you the benefits of a printing services to create your ownership and brand awareness. 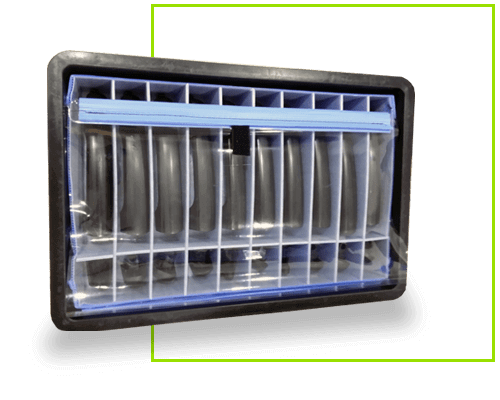 These plastic boxes have the added benefit of containing 2 enclosed handles, stackable corners and divider slots. There are also available in various colours. 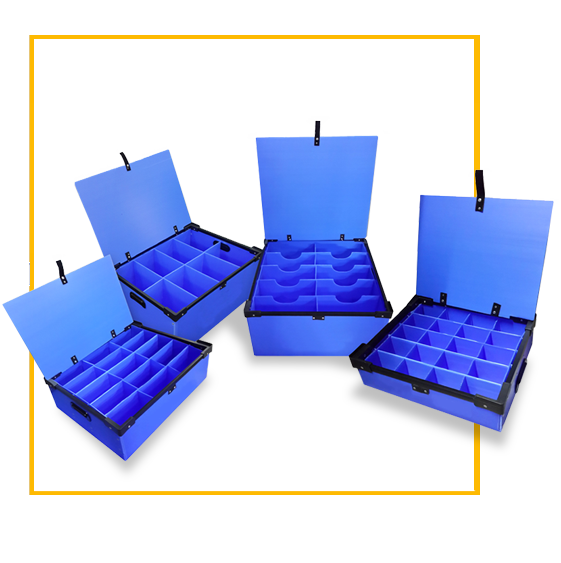 Plastic corrugated boxes and trays have the additional advantage of being in any size , which other plastic product may not able to substitute. It could be able in a foldale or collapsible design which enable space saving, and of course re-usable, saving on plastic packaging cost and resources, at the same time enhance in efficiency of an industries, hence added value to the production process. Our plastic fabrication services show a broad spectrum of advanced techniques and application. We sub-divide the customised plastic container with partition by all kinds of material, in order to achieve logistic optimization as well as protection maximized. The plastic partition box material is as diverse and innovative as you will find, such as EPS foam, PU foam, EVA foam, PP corrugated sheet, vacuum foaming tray... etc. We have the most sources of customised plastic container in various sizes and design, which you hardly find in other supply. We can create logo printing as an identifying features to the plastic container. We supply moulded plastic container which cater to help customer to store sensitive yet important parts . 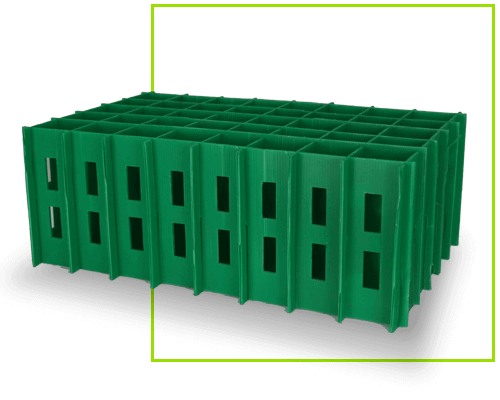 It is durable and space saving when is not used, and very much suitable to use as a returnable and recyclable box. it is a long term cost saving packaging box. Customised plastic partition or segregation to give parts a higher surface protection and improve efficiency in production process. And reduce parts defective rate.